Patient, positive oriented, individualized instruction. Columbia University, MA: Music and Music Education, Computer Science. Member of the Davis Music Teachers Association. Organized, state-of-the-art, instruction, paced for success and continued progress. I use the latest scholarly research on teaching music, as well as traditional methodologies and experience. A well rounded, highly individualized musical education. Learn from a pro that LOVES to TEACH! Learning music improves academic, emotional development, abstract thinking, and career performance. Award winning Musician, Teacher, Systems Engineer and College Professor. See my page of Services. Hear Will play Beethoven, a 2nd Year Student. 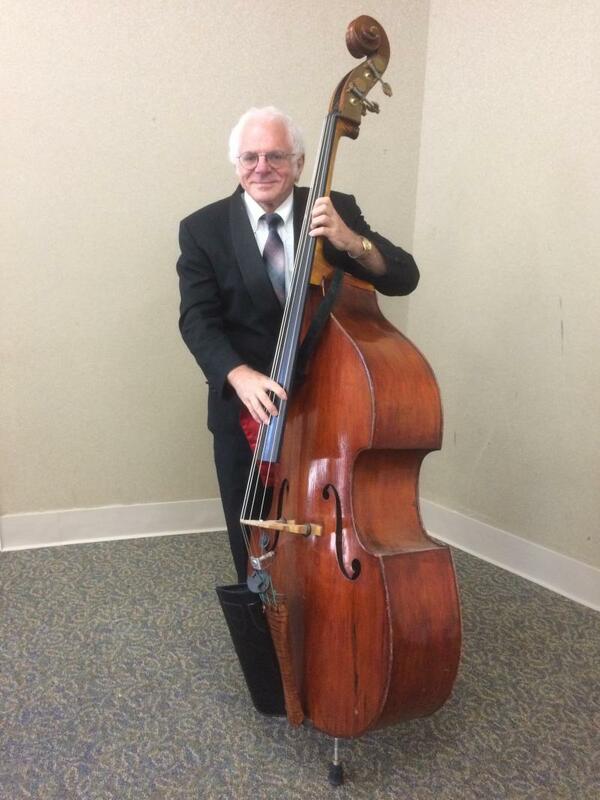 Played on Upright Bass and Jazz Guitar. Active performer all my life, all styles of music. Extensive studio, show, jazz, classical, rock, country and pop gigs. Orchestral Concert Tour of Spain. Swingtime, Played in the most active jazz/big band in the state of Florida for 12 years. Local orchestral and freelance work. I believe one should play every note with as much beauty and feeling as possible. All ages, levels, and styles welcomed. Each student is recognized as an individual. Student guitars available at great pricing. If a student has a good playing instrument, they will be more successful, have more fun and continue as students. I try to have a few instruments available at cost or will help you obtain a reasonably priced instrument. Music Study Improves Academics and Intelligence. Keeps the mind young! We've long known serious music students do better academically. It also keeps the mind sharp. Scholarly research demonstrates that studying music makes people smarter! Einstein credits his conceptual creativity on learning the violin as a child. Music Majors have the highest level of acceptance to medical school of any college majors, including pre-med. It's never too late for you to benefit from learning music. See my page on the Brain and Music. One should find a teacher that wants to teach even more than one wants to learn. I put my heart and soul into every lessons. 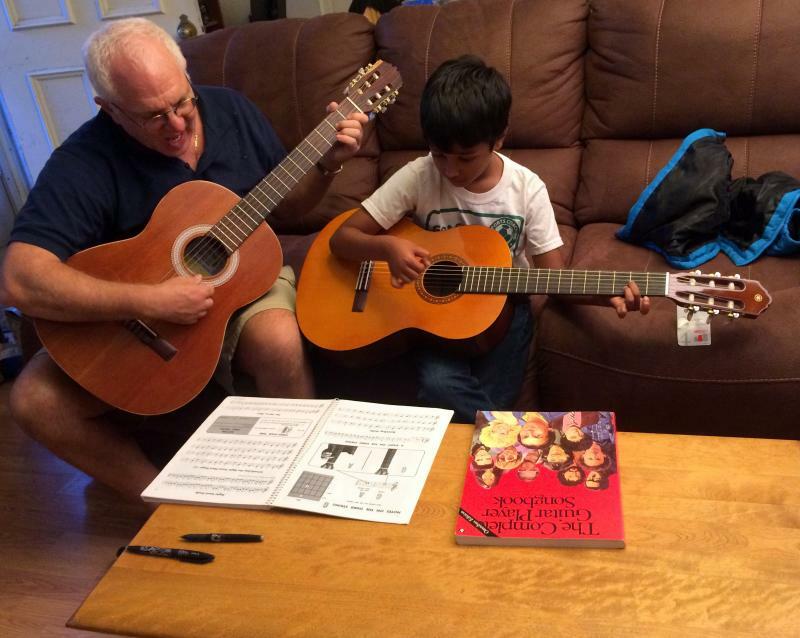 Below is a picture of a 5 year old guitar student. I love to introduce young children to music. 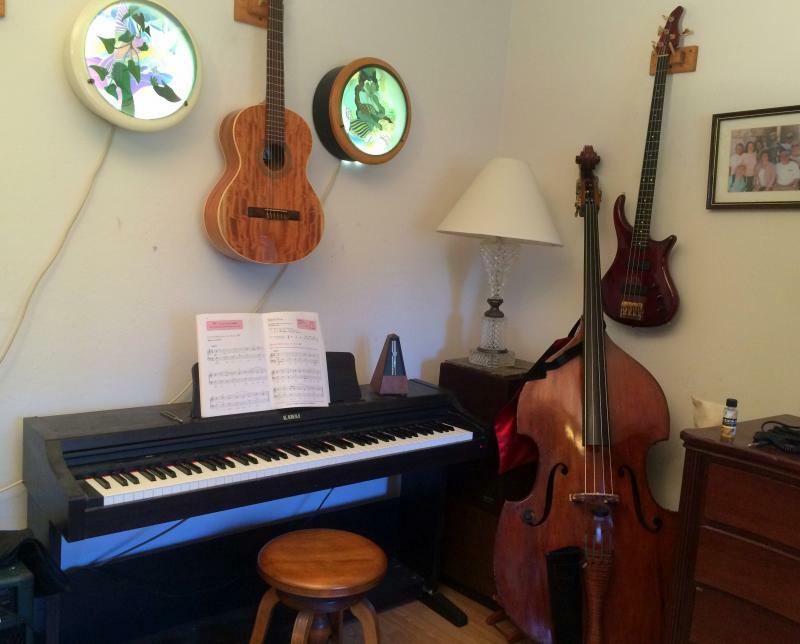 HGuitar, Bass (Upright & Electric) and Piano Lessons by professional. Columbia University, MA: Music and Music Education. Berklee College of Music, Boston, MA: Guitar and Jazz studies. CLAD: Teaching non English speaking students. I was a tenured, award winning school teacher, working with children on math, reading, writing and all academic areas. And, as a professional Computer Scientist and engineer, I have solid skills in these areas and love to help students as well. The best way to reach me is my cell phone. I do not check messages left on my home phone. 321-591-1954 Cell. Yes, an old Florida number.